Figure 5.8. Mass ratio required to change orbital altitude is very dependent on the propulsion system performance (Isp). the propulsion system, and the reduction in mass and thus engine thrust and pro-pellant flow rate. 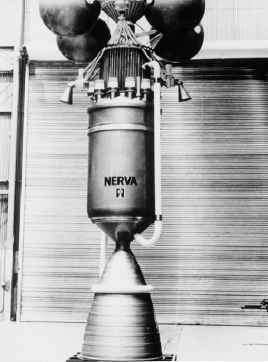 Unlike the space launcher, where the payload is about one-seventh the OEW, for the Orbital Maneuver Vehicle the payload is greater than the OEW. The OEW differs from "empty" or "dry" weight in that all of the fluid lines are filled and any trapped fluids or propellants are included in the OEW. The operational weight empty (OWE) is the OEW plus the payload. That is it is the vehicle operationally ready but without the propellants loaded. The satellite (payload) weight for the OTV is 2.268 tons. The Russian Progress capsule can deliver 3.5 tons to LEO and the European Space Agency (ESA) Automated Transfer Vehicle (ATV) can deliver 7.67 tons to the ISS orbital altitude (Wikipedia, 2008). If the OMV in Table 5.6 is extended for different payloads masses for hypergolic propulsion, the size and mass trends can be established, as given in Table 5.7. Table 5.6. Sized orbital maneuver vehicles for one-way mission from LEO to GSO.